James Surowiecki, Doubleday, 2004, ISBN 9780385503860, 320pp. 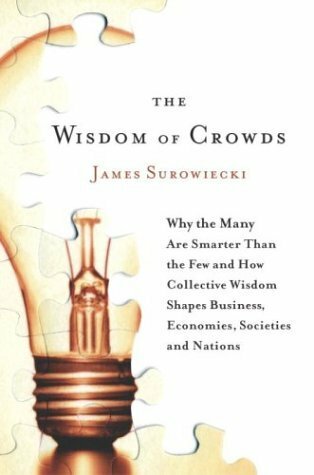 As a card-carrying member of the liberal elite, I approached James Surowiecki’s book, The Wisdom of Crowds, with more than a small amount of skepticism. If his thesis, as exposed in the subtitle, “Why the Many Are Smarter than the Few and How Collective Wisdom Shapes Business, Economies, Societies, and Nations,” was true, it would put all of my liberal beliefs about the importance of higher education and intelligence used by experts in the service of the greater good to a serious test. Would this book turn me from being an admirer of Al Gore into a Bush-head? The horror, the horror. Now that I’ve finished the book, I’m happy to say that I’m still voting for John Kerry, but I do have a higher opinion of the ability of the masses to answer perplexing problems. At the same time, I strongly feel that Surowiecki’s title and thesis are somewhat disingenious, owing more to a good marketing campaign and titular wordplay than actually expressing correctly the promise of his argument. Surowiecki attempts to deflate the classic book by Charles Mackay, Extraordinary Popular Delusions and the Madness of Crowds, and yet only mentions this famous counter argument by name twice and then only in passing. By doing so, he fails to fully address a real flaw in his thesis: when (under what conditions, size, background, etc) is a crowd a useful body as opposed to a dangerous mob. That’s not to say that Surowiecki fails to show how crowds can make smarter decisions that individual experts. Through anecdotes and discussion of controlled social experiments, he illustrates how, collectively, a group actually does much better at problem solving, mainly through the use of group error correction, i.e., while one or two members of the group might be off the answer by degrees of standard deviation, when averaging, the group as a whole comes much closer to the correct answer more often than an individual expert. In particular, his discussion of the way that markets work (in this case, not just the stock market, but Vegas betting lines as well as faux creations such as the Hollywood Stock Exchange) changed my opinion of the usefulness of these for decision-making purposes. Yet it is also in this discussion of markets that Surowiecki’s argument falls flat, in that he glosses over real market problems such as the irrationality of crowds in a bull market (such as the Danish tulip craze, the 1920s boom, or the irrational exuberance of the 90s) while making the case for how the proposed DARPA Policy Analysis Market (“a market centered on the Middle East [that] might provide intelligence that otherwise would be missed”). Surowiecki seems to me to be much more trusting of humans, whereas I’m much more inclined to believe that no matter how good a system might be, there’s also that individual expert who’s working on gaming the system, making it fail in ways unexpected. I only harp on this because I get the feeling in several cases (the DARPA chapter in particular, where Surowiecki’s disdain for the congress people who killed the Policy Analysis Market is all too apparent) that he is championing the use of market-based decision making over our current expert-based. Reading this book did make me look at situations differently, and because of such, I’d recommend it. For example, while watching the 2004 Summer Olympics, I instantly thought of this book while watching the reaction of the crowd who felt that the judges for the individual men’s gymnastics high-bar competition had not graded the Russian gymnast’s performance correctly. They proceeded to boo and make noise until the panel of six judges changed their ratings. I pondered, is this an example of Surowiecki’s thesis or an example of mob-rule, or, perhaps something he didn’t quite cover, a little of both?